recovery. Two 40 watt oven lights provide improved visibility of the interior. All Stainless Steel front, sides and top. 50/50 double door, swings open 180°. Stainless Steel, air-tight, door gaskets. 75,000 & 90,000 BTU/hr. total heat output per oven. Cavity width and depth will accommodate full size sheet pan, front to back or side to side. 5 chrome racks with 12 position chrome rack guides. Pull-out control panel for easy access to control system. Oven interior with removable baffle makes cleaning the interior easy. Easy access design for convenience in service and maintenance. Engineered to reduce energy costs and improve performance, reliability and serviceability. 2 speed 1/2” H.P. motor,1725/1140 rpm, 120 VAC, 1ph 60 Hz, 9 amp max. Thermostat control - 150ºF - 500ºF / 65ºC - 260ºC. Electronic ignition with 100% safety. 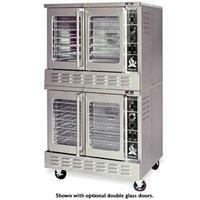 Stacking kit for double oven. Single or double door glass window. Heavy duty swivel 5” casters. Gas Shut-Off Valve, 3/4" N.P.T.